I’ve been staring at these pieces by Kimika Hara all weekend. I love the use of color. Painterly is the word that keeps springing to mind. I couldn’t be more charmed. Many gorgeous pieces at her flickr at the link above. This entry was posted in Other people's designs, Uncategorized and tagged embroidery, other people's embroidery, surface embroidery by Rene. Bookmark the permalink. Lovely stuff. I like the use of fabric bits and the free form stitching. Very nice! I just keep staring at it. 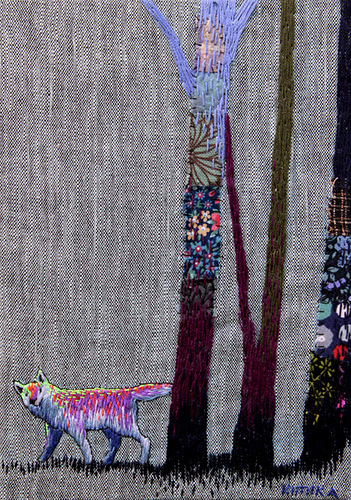 The use of color between the fabric and the stitches themselves just blows me away.